Space mirrors are a simple, fascinating technology which can give humans access to massive, base load power flows. In the long-run, they can provide virtually endless, clean power to mankind -- all the advantages of nuclear, without the mine tailings and radioactive waste. Space energy will allow us to overcome the exhaustion of terrestrial resources and grow beyond the "petri dish". -Focus sunlight onto a small spot on the earth, and use the heat to drive solar furnaces. -Focus sunlight on the tar sands and soften them up. -Gather wasted light (which would never strike the earth anyway) using mirrors, and focus it on a point near the earth for power generation. 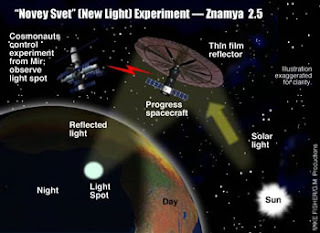 The concept is very simple -- similar to the Solar Death Ray only on a large scale. Mirrors in space may seems like an "out there" idea, but they aren't really. There already are many mirrors in space, in spy satellites and the Hubble telescope, for instance. Headlines like: "Russians will attempt to banish night with artificial 'moon'"
Clearly, any technology which already has the environmentalists horrified is not just some "out there" scheme on the drawing board. It's the ease with which it can be done which makes it so threatening. Furthermore, the genie is out of the bottle because this technology (space mirrors) has such obvious utility in so many fields. The military is interested in big mirrors, because they can use them to build higher resolution spy satellites and "Star Wars" style missile defence systems. Astronomers are interested, because they want big mirrors to improve on the Hubble. Even commercial enterprises are interested -- they want to put advertising up there. Yet another idea is to flip the mirrors over, and use them to reflect sunlight away from the planet, thus enabling precise, reversible control of global temperatures. Now, you may think that Znamya 2.5 failed and the Russians don't have it together, so we've heard the end of all this. But read this. The Space Shuttle is dead, and the Russians are dominating the space industry. It's their most succesful export industry, and one of the main reasons is that they are running it as a business. Quick, dirty, reliable and cheap -- they're in it for the money, not the useless snob "science". Personally, I could care less about the aesthetics. A big MickeyD's moon in the sky would be a small price to pay for a reliable, high-power, sustainable, clean energy source. And the big cities? Why not light them up all night with mirrors? They're already lit-up anyway. Nobody is even outside in the first place in cities like Las Vegas. They're all inside gambling and drinking and watching TV. So what if it's daytime all the time? Just imagine all the energy you could save by turning out all those lights. It would probably have a powerful anti-crime effect as well. And nocturnal animals... Who cares? I hope we disturb their rhythms because the only nocturnal animals I see in the city (and I live in a big one) is huge rats infesting the garbage bags around 3AM in front of Kentucky Fried Chicken. Of course, you might be opposed to the crass commercialization of space, but the process is clearly gaining momentum. Today, launching is a business which people engage in for the money. Space is now where the internet was in the late 80s -- a cloistered academic environment, originally developed for defense purposes, which will shortly be invaded by a circus of obnoxious profit-seeking interests. SpaceshipOne is one example. Selling trips around the moon is another. Undoubtedly, the purists are going to gripe a lot about the commercialism, just like they did with the internet, but I don't think that will stop anything.